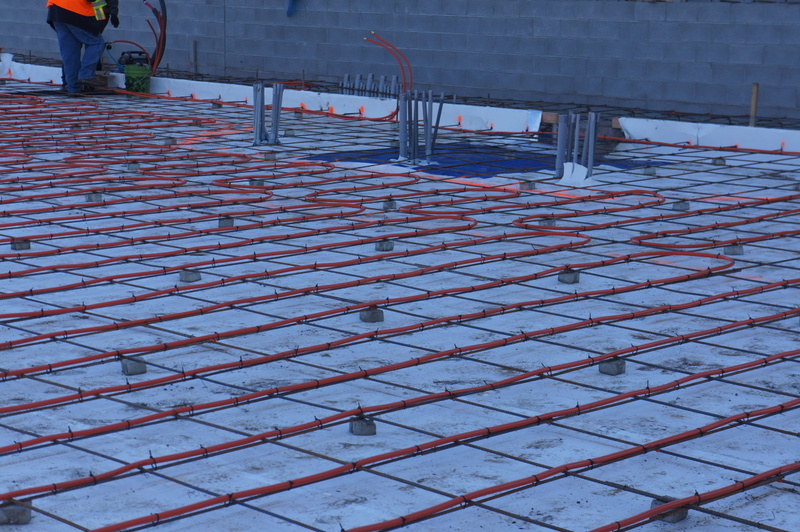 While an extra cost item, the building committee decided to install radiant heat in the sanctuary of our new Church. This system will provide a constant, QUIET source of warmth in the sanctuary. Radiant heat is most effective in buildings with tall ceilings because heavier cool air drops to the floor and remains there until displaced by warmer air. This takes longer in a larger space. 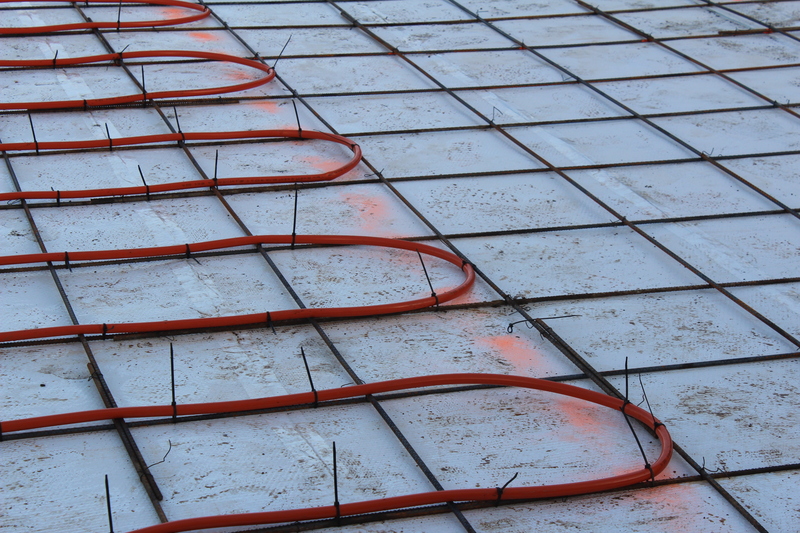 Radiant heat is efficient because it warms your body not the air around your body. You may have felt the warmth given off by a pot-bellied stove or fireplaced with glass doors or the newer oil-filled heaters that look like old-time radiators. You were experiencing the effect of radiant heat. 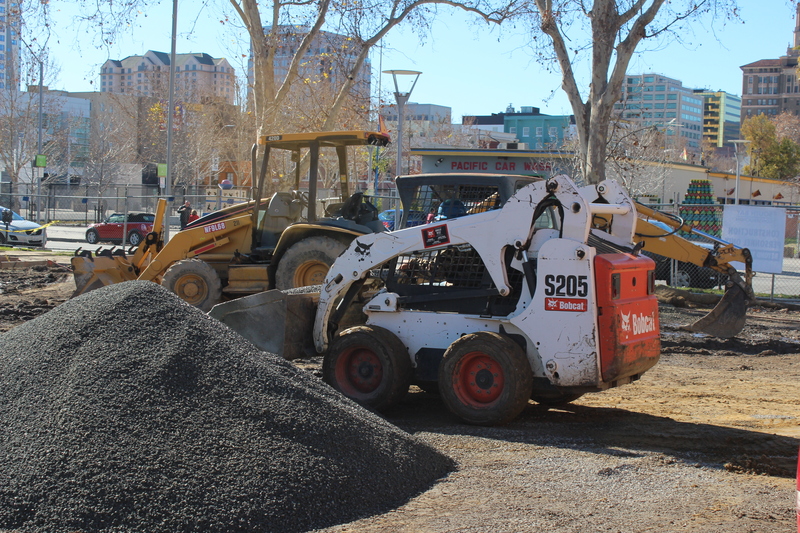 The contractor we have selected is SRC Solar, a Santa Cruz-based family-owned company serving the Bay Area. 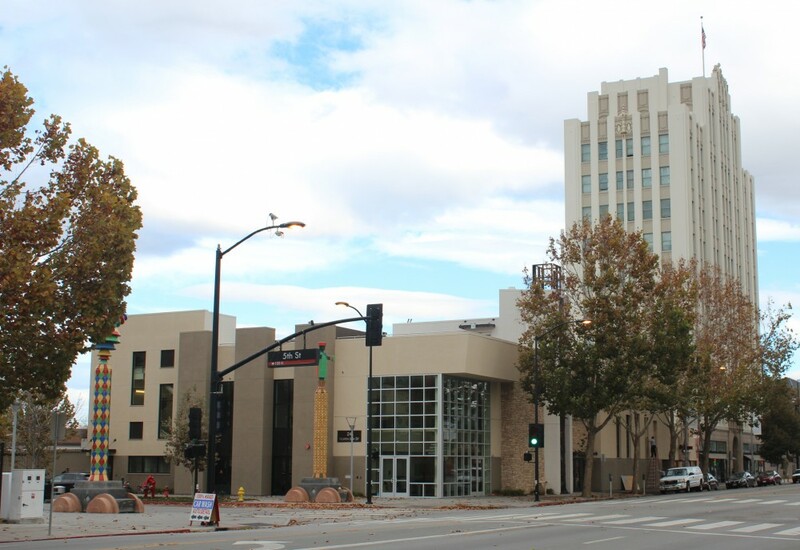 Their company has extensive experience in residential and commercial thermal systems and a proven track record for radiant heat installations. John Schantz and his team were at our site earlier today to begin the installation of the radiant heat tubing in the sanctuary. They completed zones 1, 2, and 3. 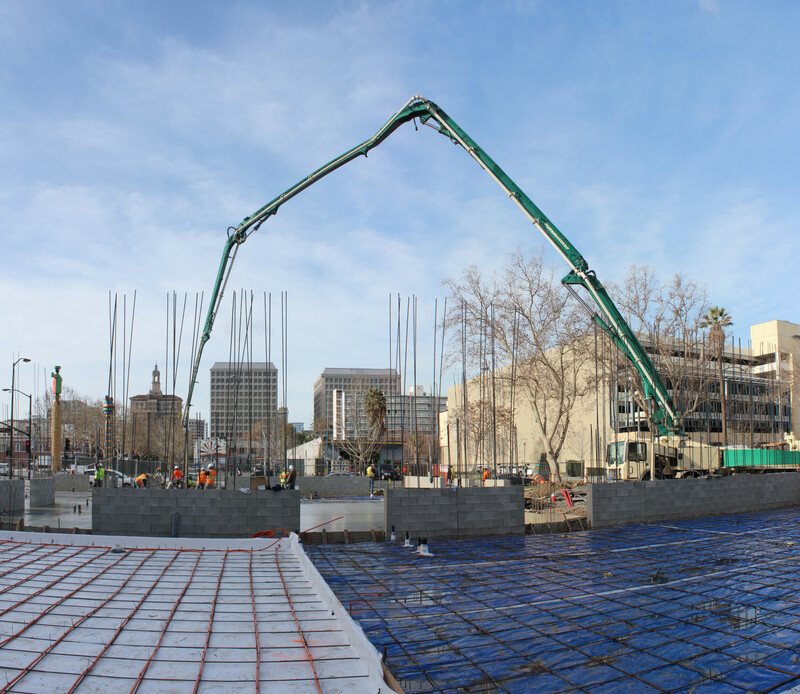 Once all plastic was placed and attached to the rebar below, the slab for the eastern side of the building was poured. 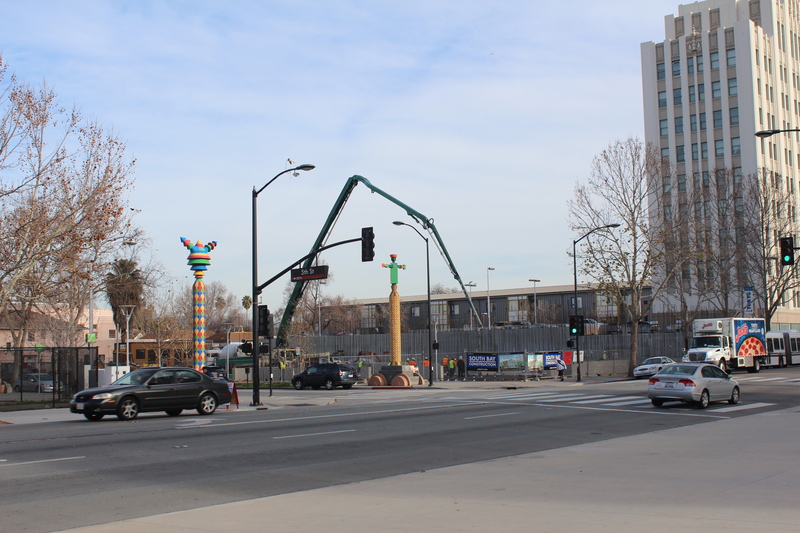 Here are a few pictures from the installation for the radiant heat on January 29th. Additional tubing was installed the next day for the runs under the band and handbell choir areas to the “stage left” and “stage right”, respectively. The radiant heat under the pulpit will not be installed until much later in the building process when the pulpit itself will be poured. 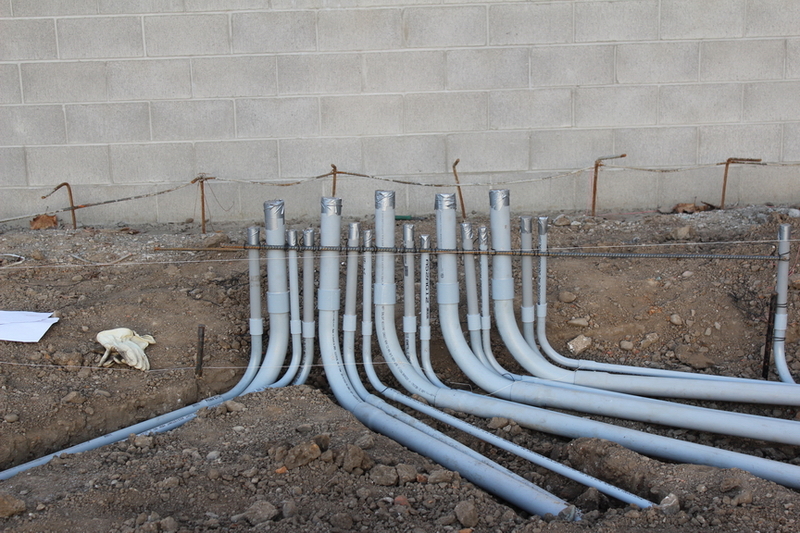 The pictures below show the overal tubing layout, details of attaching the tubing to the rebar, and the inspection during this installation. 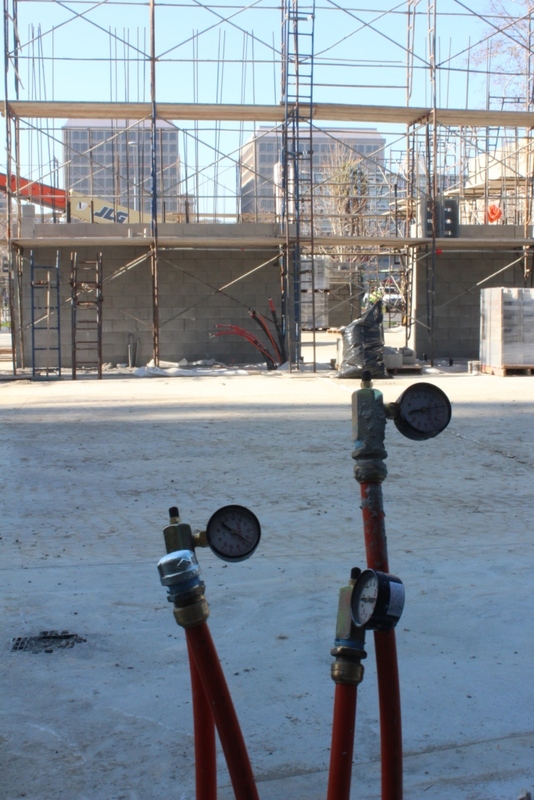 The picture with the large black set of tubing (courtesy of Marc Morgan our SBC Project Manager) clearly shows the location of the boiler room in the back, manifolds for zones 1,2 and 3 to the left, and the feed tubes for the additional manifold in the front of the sacntuary. 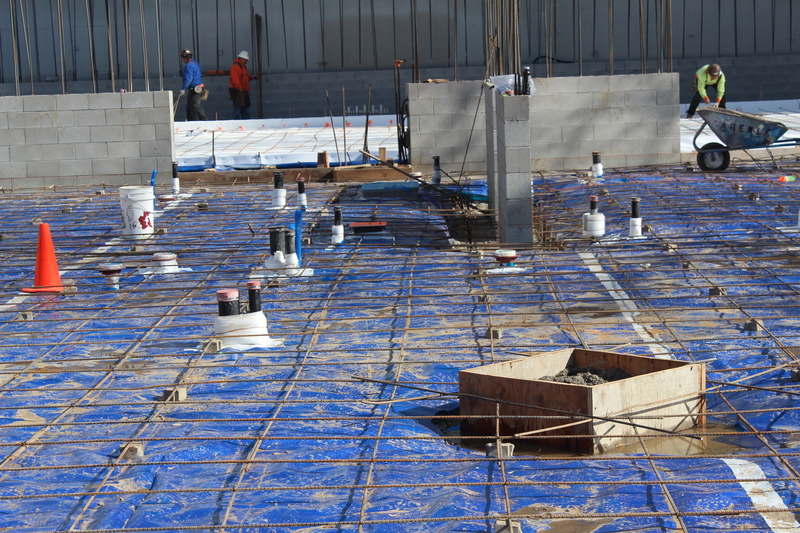 The last picture is a view from behind the pulpit that shows the finished eastern slab and the pressure testing that takes place for the two zones in the front of the sanctuary and (way in the background) for the three zones under the main sanctuary floor. The selecction of the size and location of a zone is based on areas to be separately controlled and the maximum length of tubing that can be used before the internal fluid “cools off”. 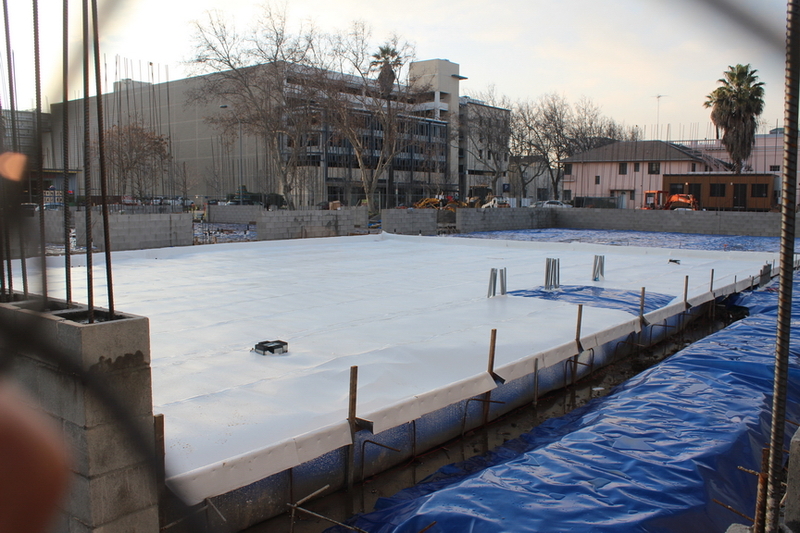 In our case the entire sanctuary will be one temperature controlled zone; the length of plastic piping is based on thermal transfer guidelines. 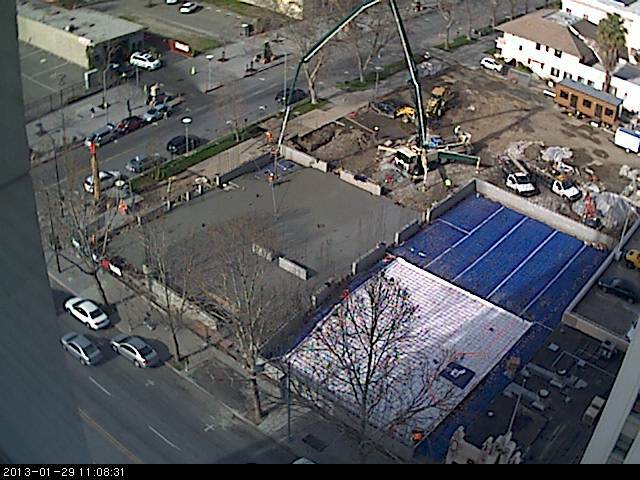 This morning the concrete pump and many cement trucks visited the site. 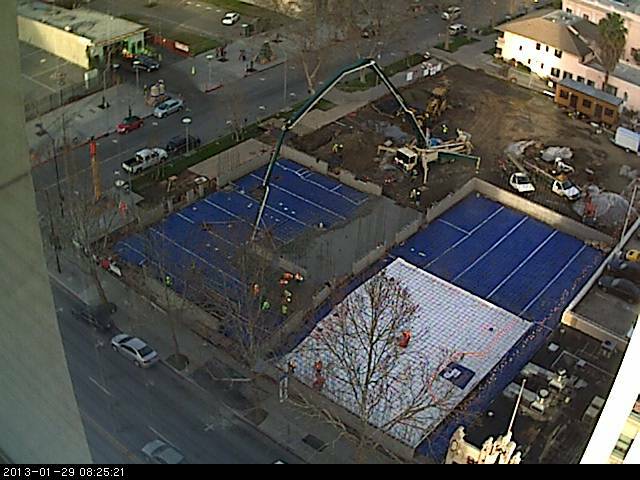 By noon the entire slab for the western side of the building had been completed. Here are pictures from the day’s events. 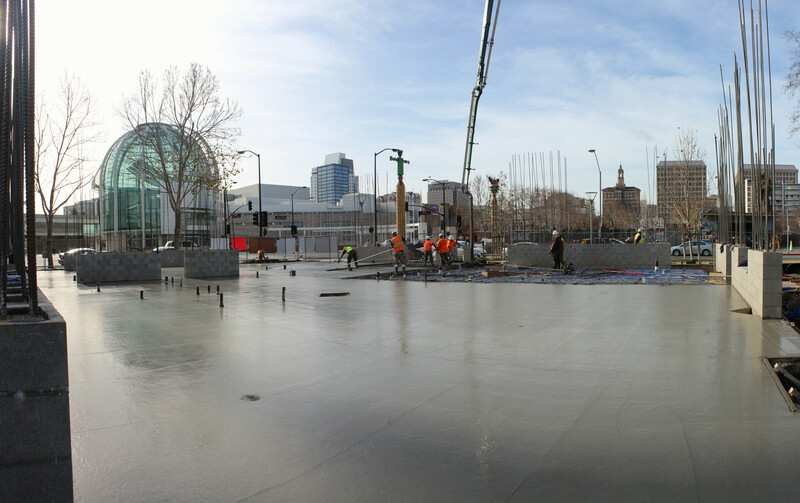 Here are a few pictures of the progress as viewed from the 11th floor of City Hall. 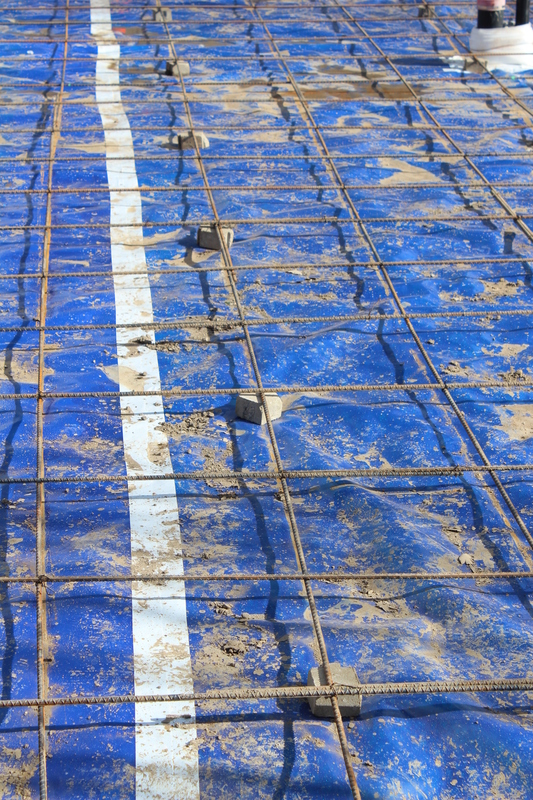 The rebar provides support and strenght to the slab and foundation. 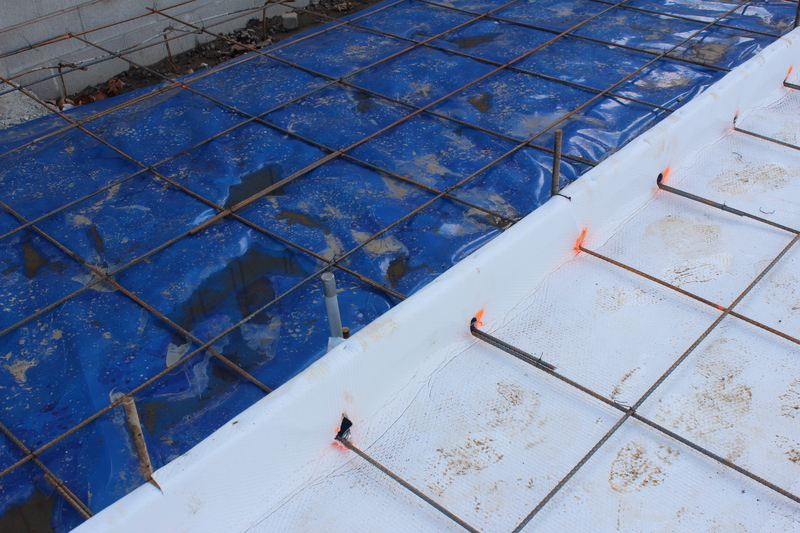 Once the vapor barrier was completed and the sanctuary insulation installed, rebar was placed over the entire floor, except along the edges. Here are pictures showing the rebar throughout the Church, including the insulation in the sanctuary in anticipation of the radiant heat tubing. The plumbing has been inspected and covered up since the last post. Trenches for the in-slab Audio Visual conduit that will link the pulpit area with the Tech Booth were dug, conduit installed, junction boxes attached and inspection complete. 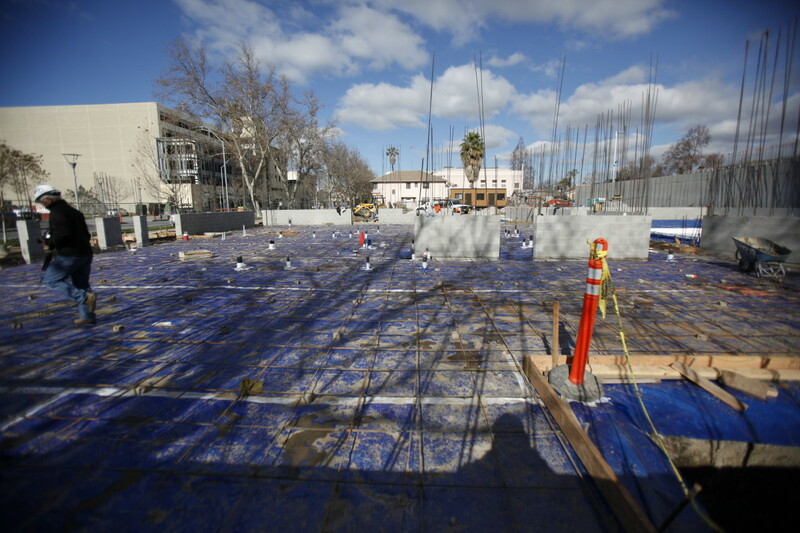 Crushed stone was laid over the entire first floor areas, a vapor barrier was added, and insulation placed on the sanctuary area where radiant heat will be installed. Here are additional pictures taken over the last couple of weeks. The panorama shot above showed the downstairs area after plumbing was installed and inspected. The next picture is taken from the pre-school corner looking toward the kitchen and atrium, followed by a picture taken inside the sanctuary from the back looking toward the platform. What started as a huge stone pile has turned into a smooth consistent layer over the entire Church. 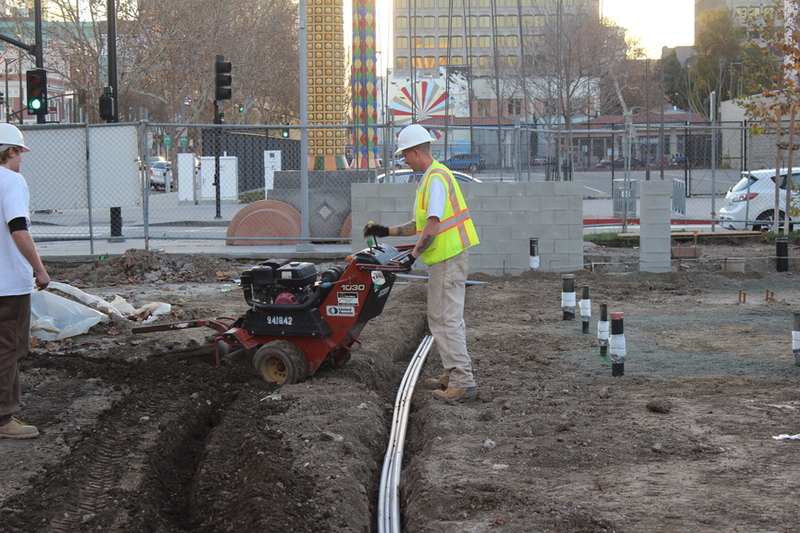 This is the trencher used to dig the AV conduit paths. The conduit runs will deliver power and data to locations under the bell tables, on the platform, and too the band members. 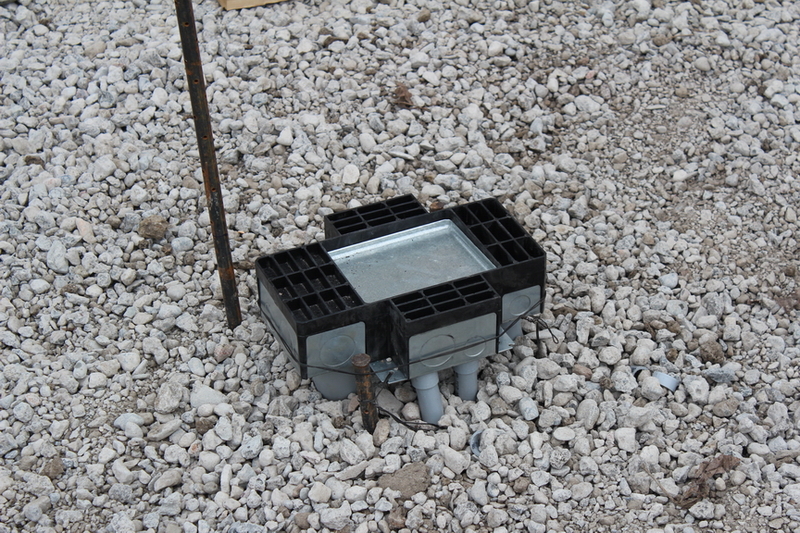 The in-slab junction boxes are made so part of the top can be ground down flush with the cement floor. 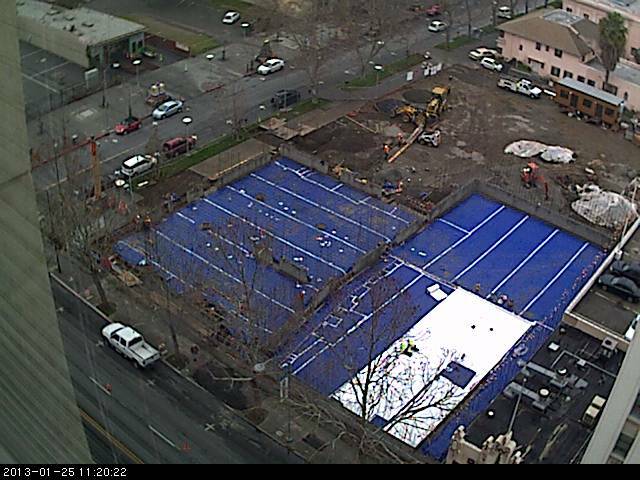 You can see the vapor barrier and insulation in the sanctuary from the Axis Network camera. 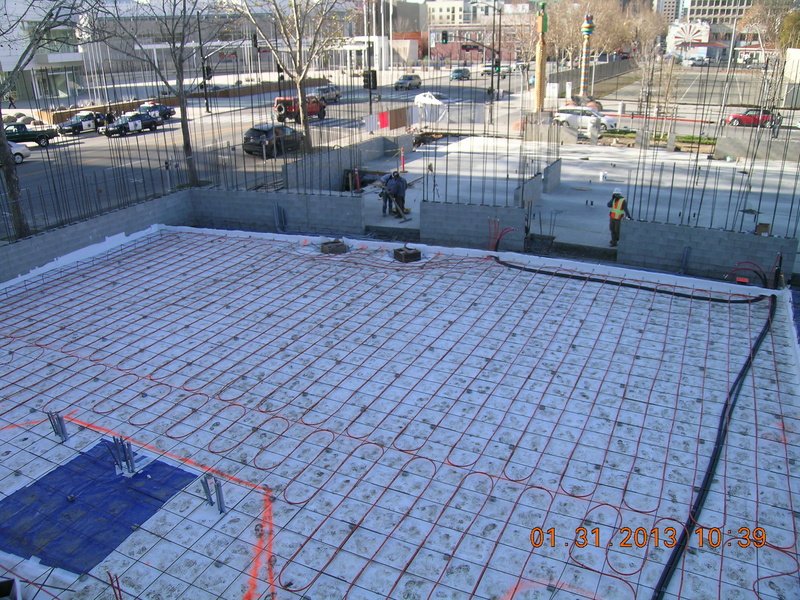 The second picture is another view of the sanctuary showing the completed insulation which will help boost the efficiency of the radiant heat. 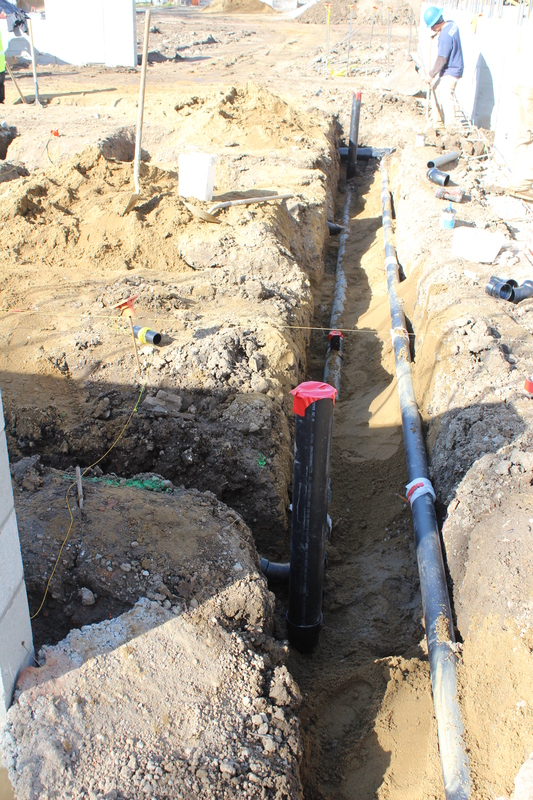 The in-slab junction boxes are made to be ground down flush with the sanctuary floor. There are five conduit runs from the back of house to the platform and sanctuary stage right under the bells and stage left under the band. The plumbing for all downstairs drains has been completed, inspected and nearly filled in. 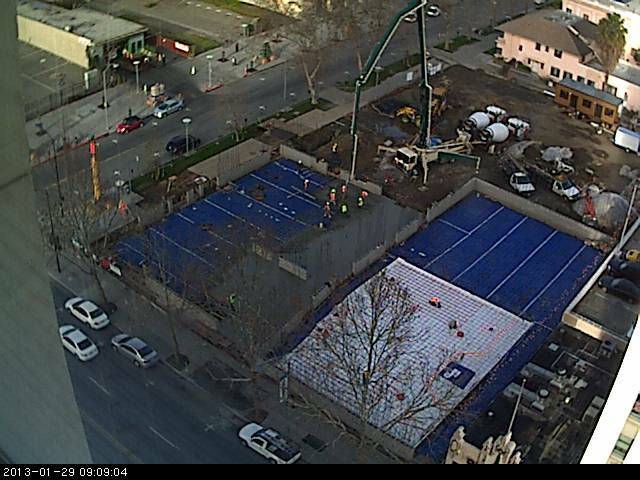 The next steps will be installation of the conduit for in-slab AV power and data in the sanctuary followed by gravel fill, re-bar reinforcement, installation of radiant heating pipes and finally pouring the slab for the first floor. 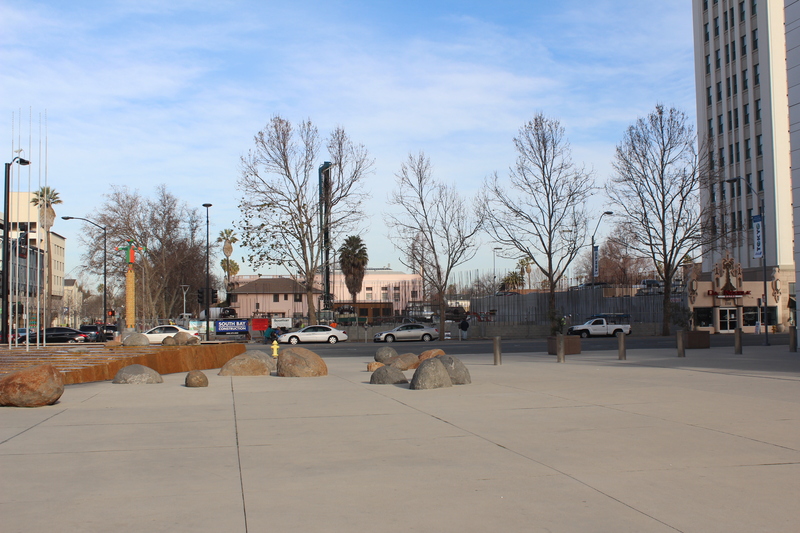 This first picture is a panorama taken from the end of the pre-school hallway looking out the front door toward City Hall. On your left is the sanctuary, and slightly to the right notice the kitchen plumbing and downstairs bathrooms. On your right is the view looking down the pre-school hallway out to N 5th St. And further to your right is the view through the playground and back to the 5th street parking lot. 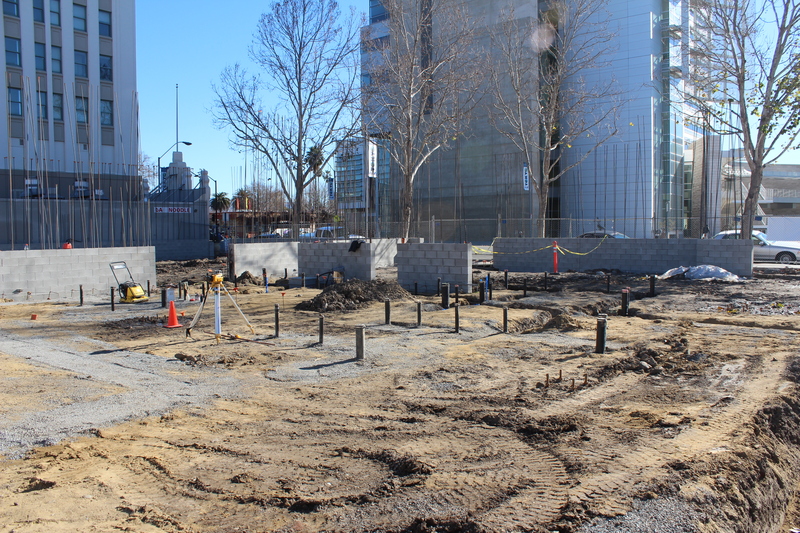 In the picture below, taken from the entryway to the pre-school, you can see the kitchen drains, pre-school restroom drains and mens/womens restrooms on the first floor. The next view shows the restroom drains in the pre-school room between sanctuary and youth room then on into the sanctuary. These two pictures show the large pile of pea-stone dwindling as the bobcat fills in the spaces around the drains. 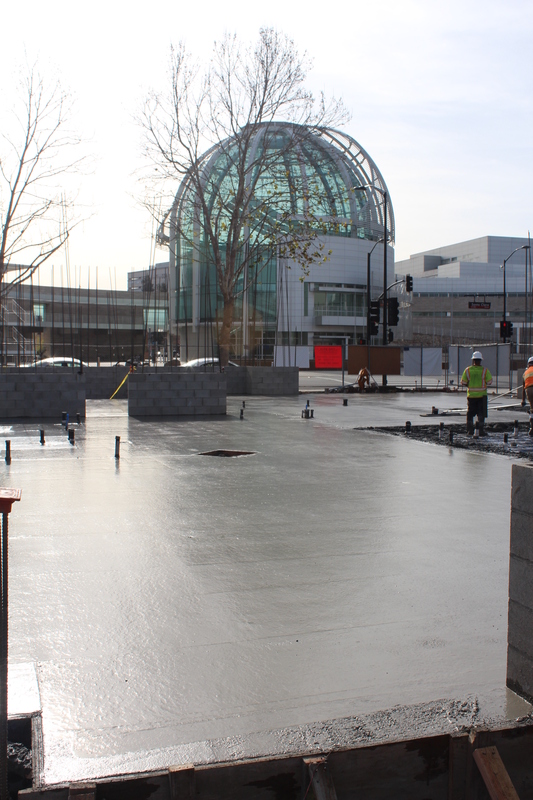 Sunny days are back and the installation of the under-slab plumbing has started. 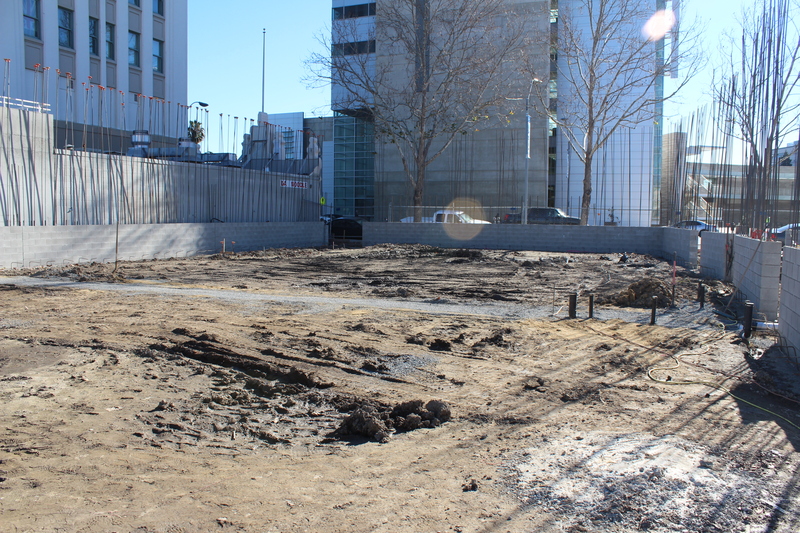 The photos below show some of the trenching that is required for the drains under the slab. 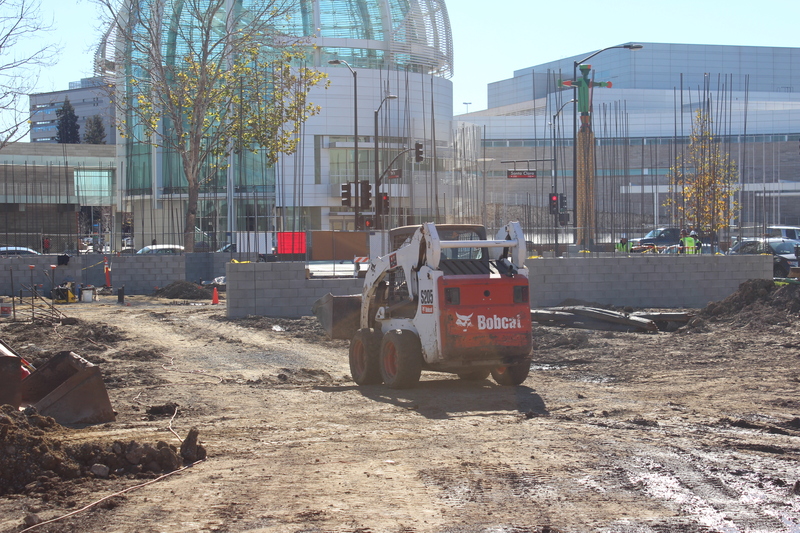 You may also notice the sidewalk on 5th street has been closed. This was done in order to make the soft cuts in the sidewalk to provide access to the services in the street. There is also a corner view of the sanctuary that extends across the multi-purpose room all the way to the other side of the youth room. Greetings to all in the New Year ! 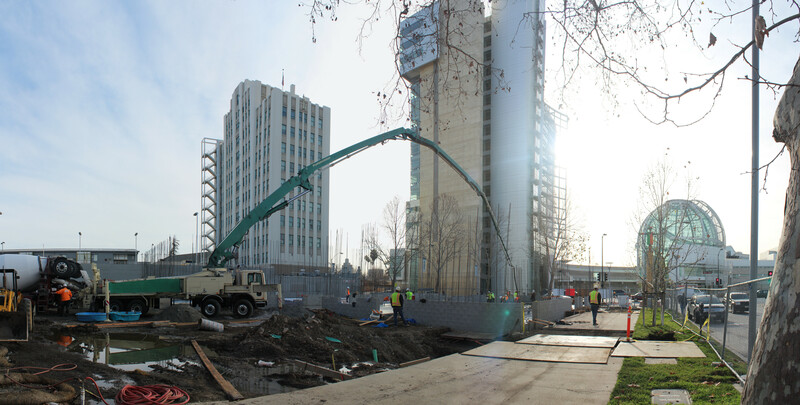 On Wednesday, December 19th (a sunny but wet and muddy day as you may recall) the grouting was completed for the first 4′ section of the C MU walls. The process is shown below. 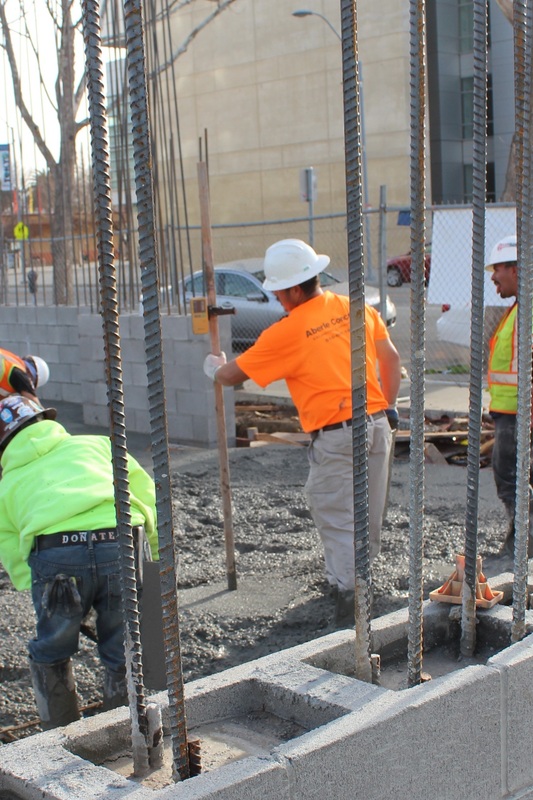 The previous post explains how the CMU wall construction is completed using the foundation, rebar, and concrete blocks. The final step includes the application of inside each of the “columns” created by the “H-shaped” blocks. 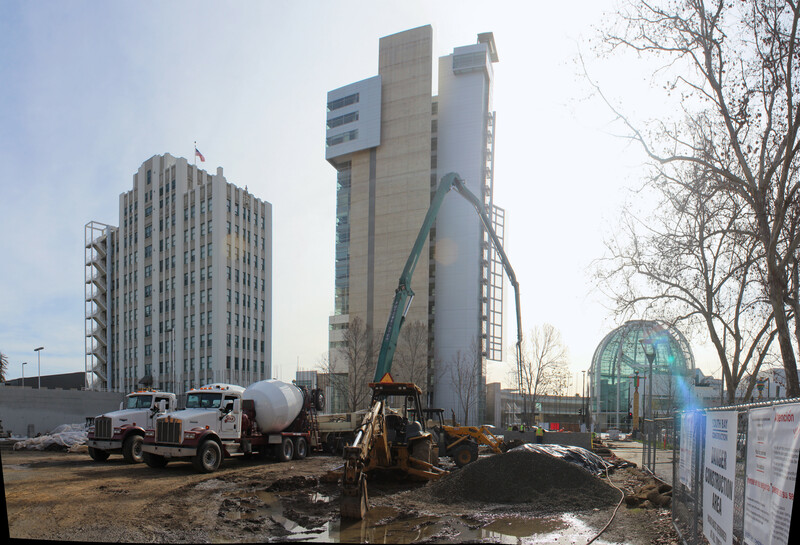 The pictures below show the arrival of the cement truck (grout is simply cement with a higher density of concrete) and the grout pump used to apply the grout to each section. 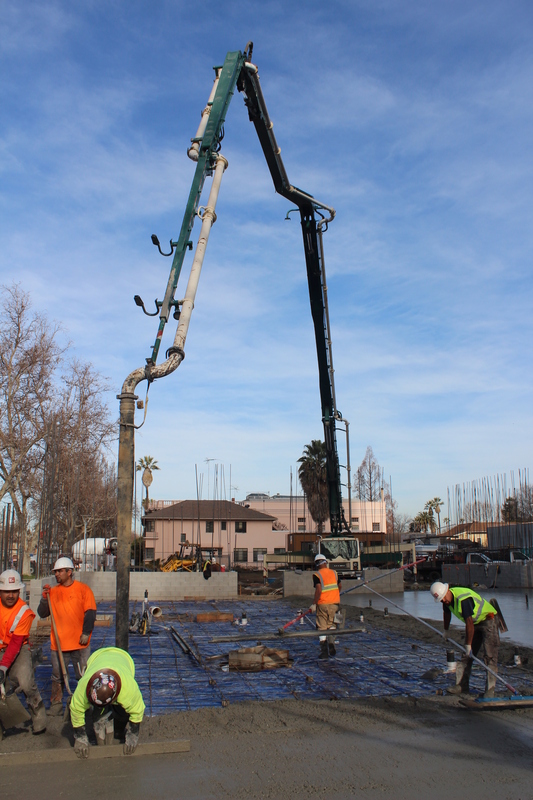 Once the grout is pumped into each section, it is “agitated” (using a device like an electric drill with a long flexible tubing that vibrates when placed inside the grout) to ensure proper settling and adhesion to the cement blocks and rebar. The final result is the first 4′ of CMU ready for inspection.